Earlier this year I had the privilege of reviewing one of the programs from Spanish for You! We found this program to be very fun and engaging while also being very thorough. Each program is based around a theme and teaches vocabulary and grammar. The program also includes audio files and printable flashcards. Curly enjoyed learning new words and putting them into practice through the lessons. I also found the program to work well for self-study and for creating unit studies! Well, Spanish for You! has come out with a new program: Viajes! The program is divided into grade levels of 3-4, 5-6, and 7-8 with each package increasing in difficulty and including more detailed grammar and vocabulary. In addition, you can buy a package that includes all levels which would allow you to study the same topic and vocabulary with students of different grades. The individual packages are $39.95 each and the combination package of all grade levels is $64.95. Spanish for You! 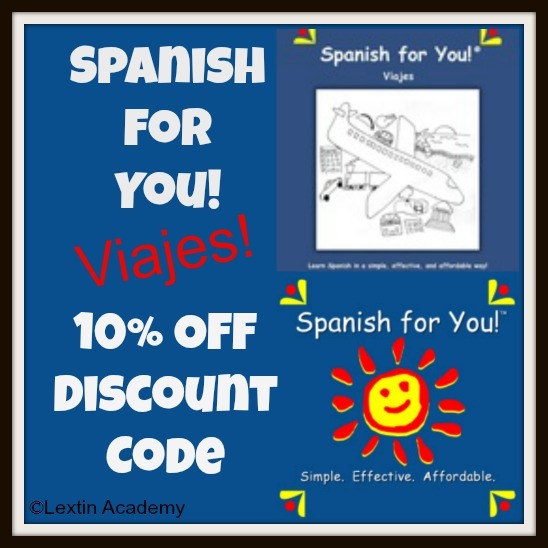 has offered to give my blog readers a 10% discount on the new Viajes! curriculum! For the grade 3-4 package, enter code newviajes34 at checkout. For the grade 5-6 package, enter code newviajes56 at checkout. For the grade 7-8 package, enter code newviajes78 at checkout. For the combination package, enter code newviajes38 at checkout. The codes expire at the end of 2013! The discount will be calculated upon checkout after entering the code.